We arrived in Houston almost four hours late, but along the way we had kept Nancy’s brother Steve–who was picking us up at the station–apprised of our progress. The Houston depot is on par with your average Greyhound bus station and is located in a very industrial part of downtown. Due to the unusual street routing in the area, the station can be a bit tricky to find. However, a previous trip had already acquainted Steve (and us) with the situation, so he was on the platform waiting for us when the train pulled in. We bundled into his car and he promptly whisked us off to his home in The Woodlands, an elegant community just north of Houston. Steve and Irmi have a beautiful house on a small man-made river. We spent a good deal of our time on their back patio, looking out over the river and supervising their grandson, Aaron, and their youngest daughter, Helena, as they cavorted in the hot tub. We had worried about the weather, but for no reason as it turns out: instead of the expected rain, it was, if anything, a bit warm. And humid, of course; this is Houston after all! On our second day in Houston we picked up our rental car in preparation for an early start the next morning. I was surprised, but most pleased, to see what “Mr. Hertz” (as my Dad would say) had set aside for me: a silver Mercedes C250 (see the photo, below). As they handed me the keys I double-checked my contract to make sure that there wasn’t some mistake. Nope, I had requested a full-sized car, and that is what I was paying for. Celebrating my good fortune, I hopped into the car and proceeded to follow Steve back to the house where we would enjoy a nice BBQ with Steve, Irmi, and the kids. The next morning, having heard from my nephew Kevin, we loosened up our plans somewhat. Kevin (who is at Baylor, in Waco; our next destination) wasn’t going to be able to see us until 2:00pm. Given that Waco was only about a three hour drive from Houston, we had the morning free, so we packed for the journey and then had a lovely breakfast out with those members of the family who weren’t in school by this time. With full stomachs we said our goodbyes and proceeded to drive to Waco. There are a number of routes you can take when driving from Houston to Waco; ours kept us on I-45 for almost half the distance, after which we switched to smaller Texas and US highways. As we were heading north out of Houston, I noticed a sign I’d never seen before: it said “Evacuation Contraflow.” The sign marked a removable section of the barrier in the otherwise solid divider between the opposing lanes of traffic on I-45. Presumably, in the event of a hurricane they can open this up and allow traffic to flow out of the city using all available lanes, facilitating the evacuation of the city. That’s not something I’ve ever seen on the west coast…. 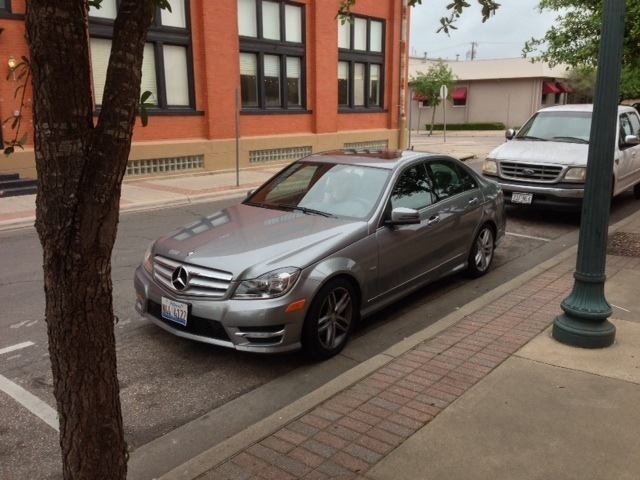 All the way for Houston to Waco I was loving the Mercedes; although it was a C-class car, and thus relatively cheap for a Mercedes, it drove well and we rode in great comfort, thanks to both the dual-zone climate control and the Sirius-XM satellite radio. I was almost sorry to have to park it when we finally made it to our hotel in Waco, but looked forward to an interesting drive (little did I know how interesting) the next day. We made a prompt start the next morning, only sticking around long enough to grab muffins and a coffee (for Nancy; I had a hot chocolate) that we could enjoy as we drove. Our plan was to drive through Austin to the little town of Kerrville, Texas, where Steve and Irmi’s oldest daughter Nicki lives. We could have stayed on the Interstate all the way to San Antonio, and then taken I-10 to Kerrville, but we elected to take the scenic route out of Austin, heading through Johnson City (where LBJ grew up, and near which he and Lady Bird had their ranch) and through Fredericksburg, a cute little town settled by German immigrants. You always think “if only..” after something happens, wondering about the chain of events that led up to that thing happening. We certainly did. About 30 miles west of Austin proper, we were traveling along at the posted speed (60-65 mph) in the right-hand lane of a four-lane rural highway when I noticed the guy in the next lane over (he was a couple of car lengths ahead) making a panic stop. Not able to see exactly what was going on, I attempted to do the same, but the deer–it turned out to be a deer that the other guy was trying to avoid–having made it all the way across the two opposing lanes of traffic, the center two-way left-turn lane, and mostly avoiding the guy in the lane to my left, wasn’t able to avoid my car. I hit him full on, smashing the drivers-side lighting cluster and quarter panel, as well as putting smaller dents in the hood and the front edge of the driver’s door. I don’t know exactly what speed I was traveling at when I hit him, but even with the assistance of the car’s antilock brakes I’m guessing I was still going 50+ mph. In any case, it was enough; he was quite dead, and our rental Mercedes was looking pretty beat up. Fortunately for the car and for our trip, the damage was limited to the one headlight cluster and some sheet metal; other than a bit of stickiness in the driver’s door, the car continued to run just fine. So we were able to eventually get to Kerrville as planned–although a couple hours later than scheduled, due to the fact that we had to deal with insurance, Hertz, and the Hays County Sheriff (who had no real interest in us or our car, due to the fact that no one else was involved, no one was hurt, and no public property was damaged). The incident itself had happened so quickly, it wasn’t until some time later that we had time to reflect on what had happened. Nancy and I both felt terribly bad for the deer; the poor guy was just lost and confused and probably terribly frightened by all these large metal monsters rushing at him. I was greatly relieved that the car was running OK: a bit more to the center of the grille and the radiator might have been damaged, really putting a dent in our trip. I spent a good part of the rest of our drive going over worst-case scenarios (a pessimist by nature, I’m prone to doing that) and couldn’t come up with much, so later–after the car was back in Hertz hands, and we were checked into our next hotel, and after drinks and a very nice dinner–I was eventually able to push the incident towards the back of my mind and refocus on our trip. We left the unenviable task of taking care of the dead deer to the sheriff and resumed our journey, somewhat subdued but counting our blessings; it could have been so much worse. Thanks to Nancy and her cellphone, we got our insurance company claim filed and got things started with Hertz before the sheriff had time to get there. So except for now having a somewhat sad-looking car, and having a couple of forms to fill out (the sheriff’s incident report, which we have to mail in, and the Hertz damage form), we were able to press on to Kerrville, where we had a delightful time chatting with Nicki at a local bookstore/coffeehouse. The drive from Kerrville to San Antonio was uneventful, and, frankly rather anticlimactic. I made one brief stop at a Shell station to add a bit of gas and to clean off some of the–er–remains, and then we headed straight to the Waterfront Mariott in San Antonio, the hotel nearest to ours with a Hertz desk. You park the car in an underground garage and then proceed upstairs to handle the return paperwork, so no one from Hertz was there to exclaim in horror at what had happened to their car. Upstairs, they simply processed the return as normal and then had me fill out the one-page form that asked for insurance info, the nature of the damage, and a brief account of the incident. It only took a few minutes to fill out, after which we were free to enjoy the evening in San Antonio, unencumbered except for our memories of that day’s events. Note: I’ve purposely skipped over details of our time in Waco and San Antonio; this post is long enough. I’ll back up and cover those in my next post. This entry was posted in An Amtrak Grand Tour on May 2, 2013 by Greg Wilson.